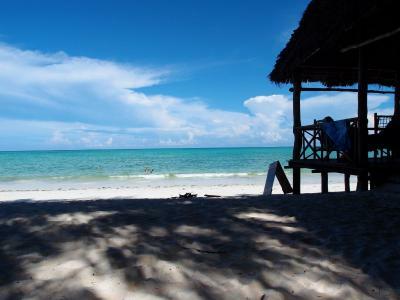 Lock in a great price for Paje Hotel – rated 8.1 by recent guests! 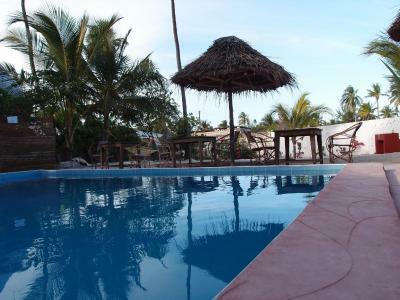 nice pool, nice rooms, the air condition works fine, the kitchen equipment is also good. The manager is very arranging. 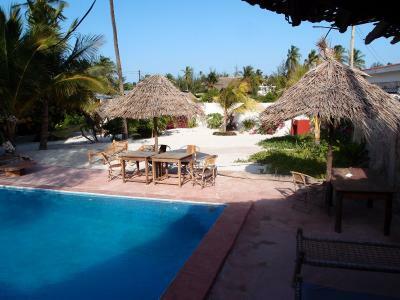 With a small clean pool and a nice garden. . We can cook and prepar breakfast in the kitchen. The rooms on the ground floor are more quiet. You can buy water at the bar. 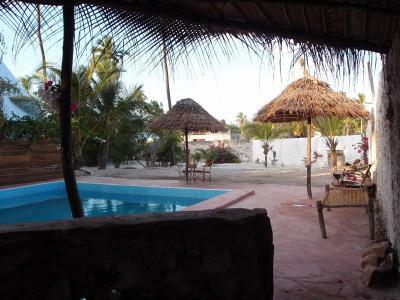 Staff itself was very friendly, nice pool, sweet garden, one is able to cook, so great for low budgets and the other rooms are nice . 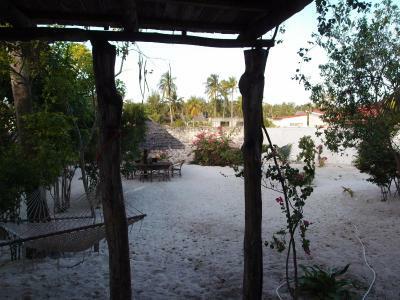 Helpfull staff, close to the beach, nice garden area. 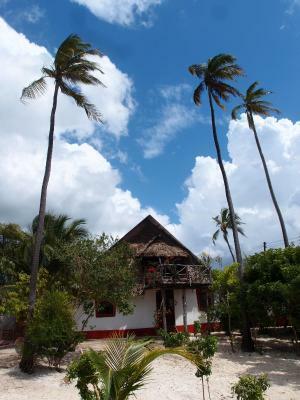 This is a wonderful little oasis in Paje. It's not far too the beach but it's kind of a weird path to get there (but easy once you know it). 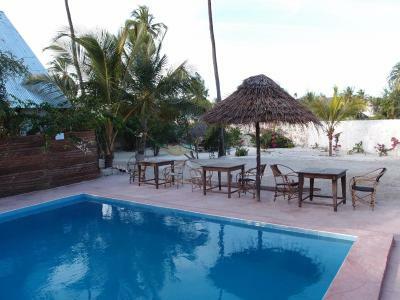 Being right off of the main road it is easy to get transport back to Stonetown on a Dala Dala (2,000 shillings per person) and there are some very good little local restaurants that charge fair prices (about 1/3 or what you pay on the beach). The beach access it to the Northern part of Paje where the beach is at its nicest - so that is great. 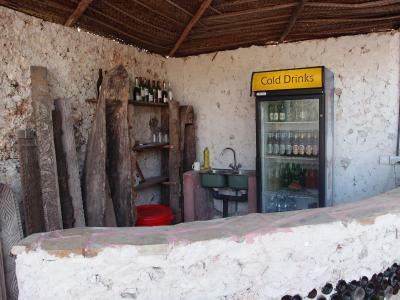 Cold beer and sodas are available on-sight for fair prices. We definitely enjoyed the pool. the hotel have a good location is small so we feel like a home. Have a nice kitche where we cooked somedays. Mirage, the manager was so kind with us. He helps us to booking our bus ticket using his telephone. Me and my friend appreciate too much his help. Good value for the price. Friendly staff. Swimming pool. 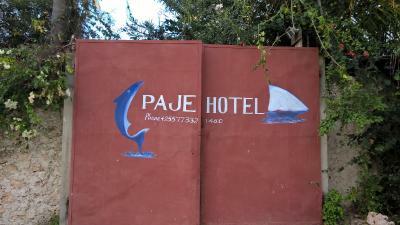 We had a great time at Paje Hotel. 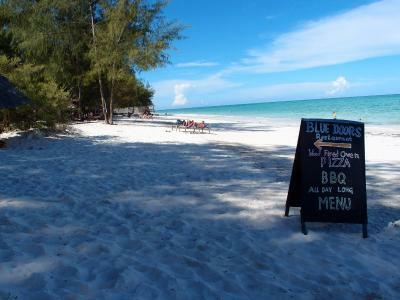 It’s a nice, clean place with a great chill out area outside and very friendly and welcoming staff. 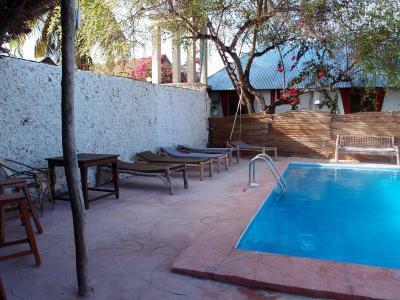 Paje Hotel This rating is a reflection of how the property compares to the industry standard when it comes to price, facilities and services available. It's based on a self-evaluation by the property. Use this rating to help choose your stay! 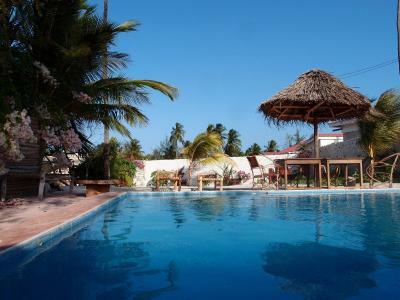 Located 1,000 feet from the beach and located 100 feet in front of the Sea Weed Center, Paje Hotel offers an outdoor pool and is located at the heart of Paje Village. 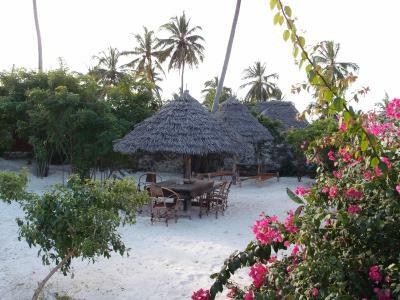 An array of activities can be enjoyed in the surroundings, including kite surfing, snorkeling and diving. 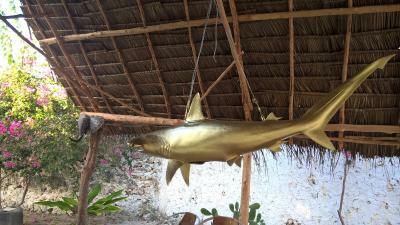 All rooms include WiFi, ceiling Fans, mosquito nets, linen and towels. 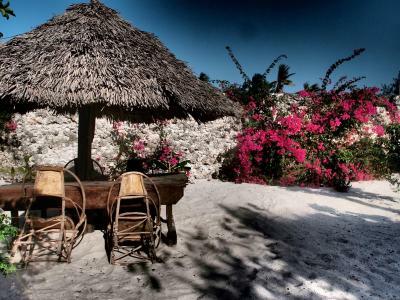 Most rooms have a private bathrooms and air conditioning. 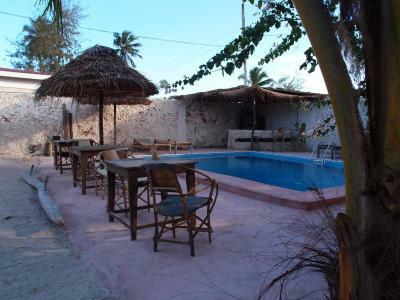 Paje Hotel has a bar, BBQ area and a spacious garden with sunbeds, umbrellas, hammocks and dining areas. It also offers free parking and luggage storage. 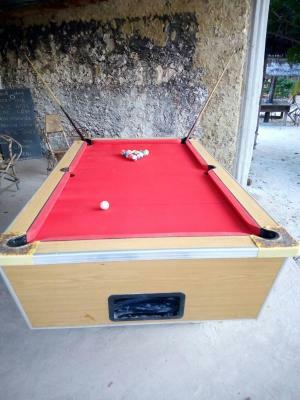 Guests can also relax and shoot pool at the pool bar. 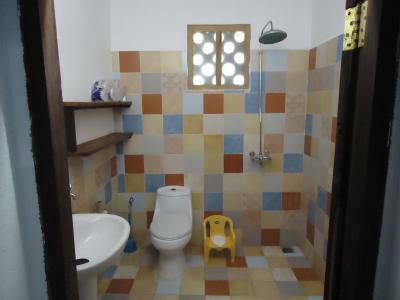 The property also features a free use kitchen. Shops, supermarkets, busses, bars restaurants are within 150 feet. 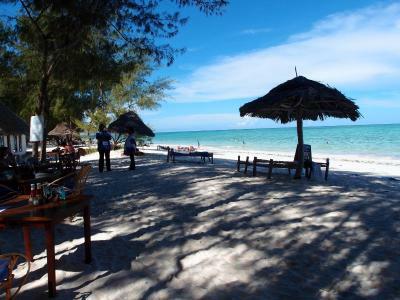 Zanzibar airport is located 32 mi away. 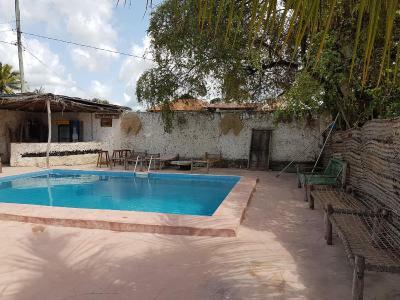 This property is also rated for the best value in Paje! Guests are getting more for their money when compared to other properties in this city. When would you like to stay at Paje Hotel? 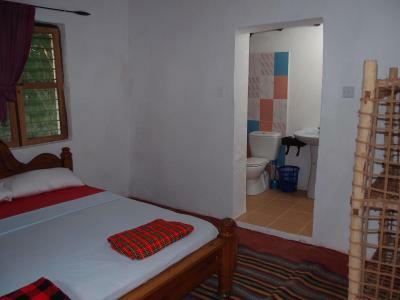 This twin room is air-conditioned and has a private bathroom. 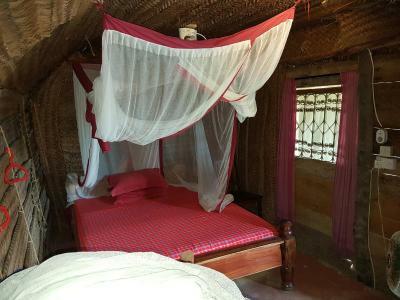 It is equipped with a fan and mosquito net. Guests have access to a fully equipped kitchen. Twin Room with Private Bathroom This twin room is air-conditioned and has a private bathroom. 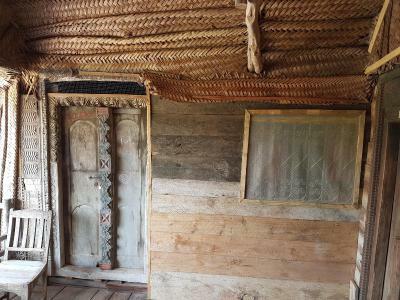 It is equipped with a fan and mosquito net. Guests have access to a fully equipped kitchen. Guests in this double room have access to a shared kitchen. 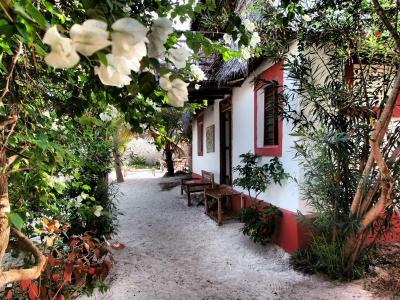 The bed has a mosquito net, and the private bathroom is fitted with a bath or shower and comes with free toiletries. 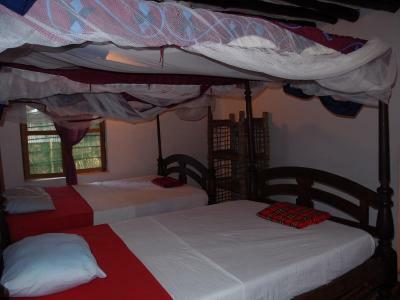 This smaller single room has a shared bathroom and is equipped with a ceiling fan and mosquito net. Guests have access to a fully equipped kitchen. 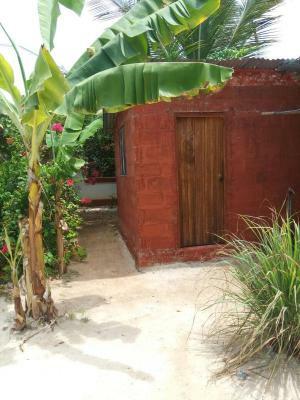 Located upstairs with outside terrace, private bathroom, ceiling fan,and mosquito net. 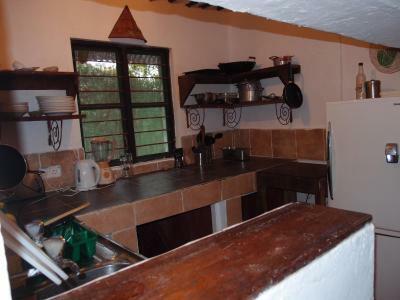 Guests have access to a fully equipped kitchen. 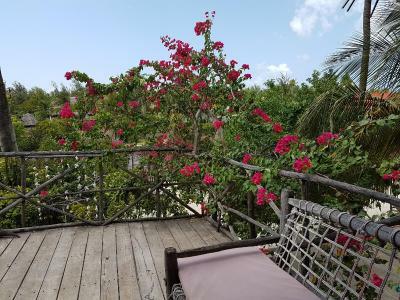 If you are a group of more than 4 people, you can book/add Room 7, to your booking which offers you an adjoining double, so can accommodate 2 extra people. 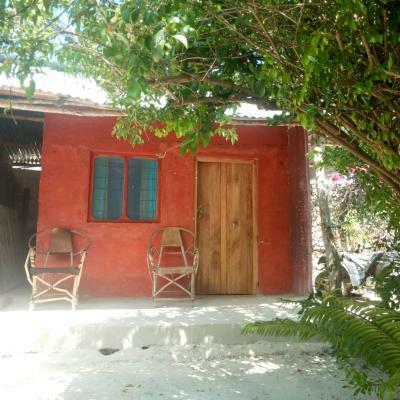 Thus giving you 6 pax capacity with the whole upper floor with terrace to your selves. We have 3 rooms of this type so called rooms 7, 8 and 9. 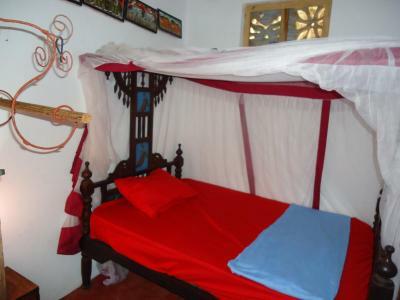 All 3 rooms have a double bed draped with a mosquito net, has a fan. Room 7, is on the upper floor of the main building. Rooms 8 and 9 are detached and located outside in the garden. 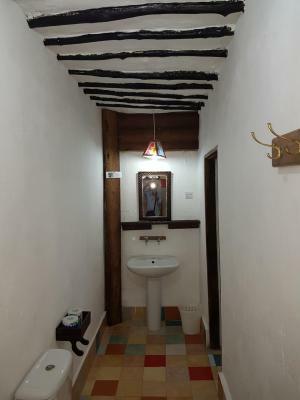 We have 3 shared bathrooms, of which 1 is located inside the main building and 2 outside. 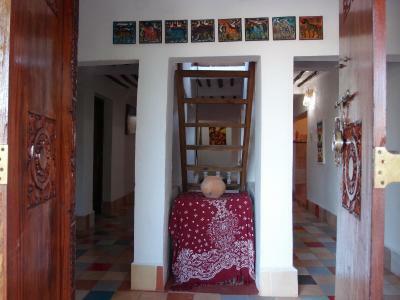 All guests have access to a fully equipped kitchen. 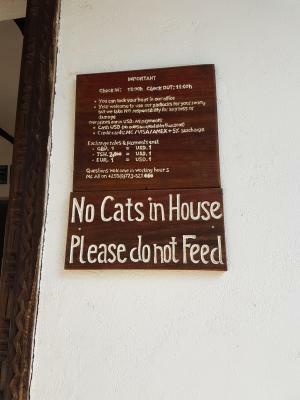 House Rules Paje Hotel takes special requests – add in the next step! Paje Hotel accepts these cards and reserves the right to temporarily hold an amount prior to arrival. 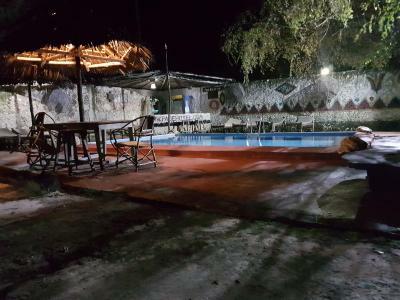 Please note that guests should call the hotel manager Mr. Ali Top on +255-(0)77321460 should they require assistance locating Paje Hotel. Please inform Paje Hotel of your expected arrival time in advance. You can use the Special Requests box when booking, or contact the property directly using the contact details in your confirmation. Noicy at the small pool. A lot of banging in doors since they didn't seem to fit properly. Easy to fix! To far away from the ocean. May be just 5 minutes walk but on the map it looked like close to the beach. AC! Very nice manager. Nice garden. Close to the beach and to the centre, but at the same time quite and away from the touts. 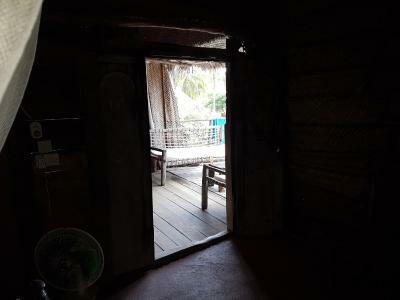 Peacefull and comfortable room & bed (room 3, very quite). Usefull kitchen, but also enough places around to have lunch / dinner. Would be nice if the bathroom had the door. I liked the pool and the garden. 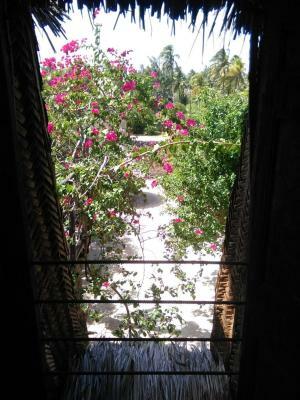 It was little bit "lost in the middle of many dirty streets", mostly when you are coming from the beach. 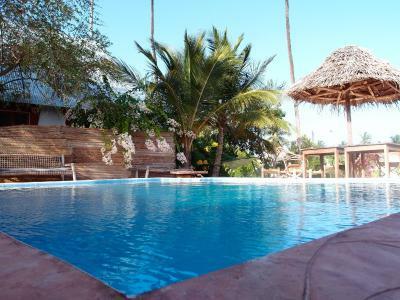 They have pool and its distance from beach make it calm place with no hurry, just enjoying your book, pool or whatever you like. Also AC in the room was nice surprise. its a little bit far from the beach..so 10 minutes walking. The place was nice. The best thing was the swimming pool. The manager was really friendly (although sometimes a little hard to find). 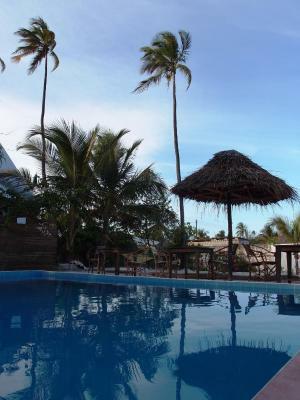 The swimming pool was really nice to relax, especially if you want to get away from the street vendors that abound on the beach. The room was very clean and the kitcken well equipped. 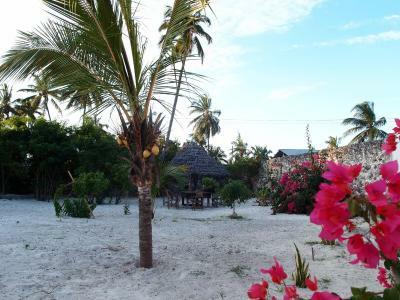 Close both to the beach and to the village. We will stay there for sure if we go back to Paje! The location was a bit longer walk from the beach and supermarket than I thought. But that really wasn't a big thing. The room! Ac! 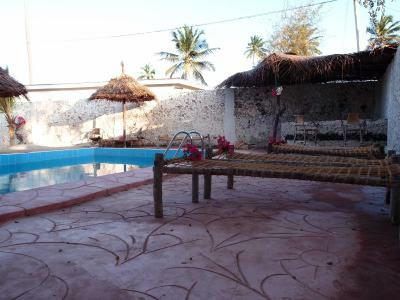 And the pool area with the pool table. And the fact that they had a functioning communal kitchen! We had the most basic room they had. It was good value for money but felt like living in a carport. Staff was friendly and with both fans on we easily survived the hot temperature in the room. I think the other rooms looked much better from what i saw. Small Single Room with noisy fan. Bed too small for anyone over 5ft 8". Rustic but charming. Great pool to cool off in after a hot day. Spotlessly clean kitchen & bathroom with warm shower. Quiet surroundings. Great value! Good hotel for that price. 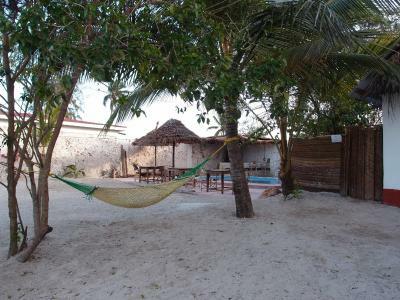 Nice garden with many hammocks and swimming pool. 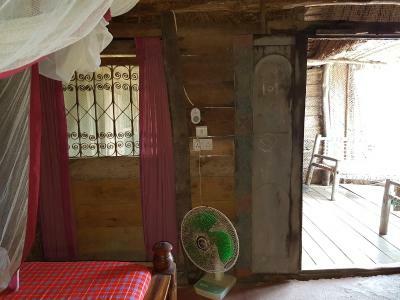 Double room with air con and fan, good bathroom. It doesn't feel safe to walk alone after the sunset. You better take taxi or have dinner just around the corner. 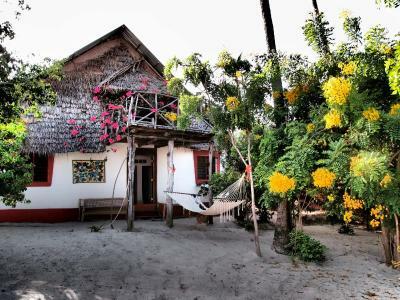 Low price accommodation near the beach. Pool was really nice extra benefit. If you are very noise sensitive, ask for a room downstair with aircon.